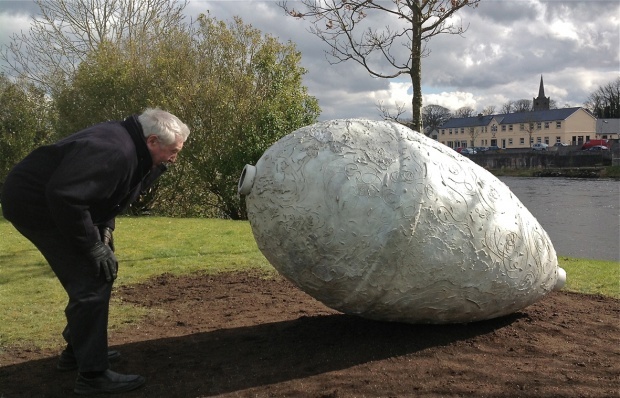 The artist’s concept for the sculpture suggests both an enlarged egg and resembles a fishing float, referring to the town’s status of Salmon Capital of Ireland. The sculpture is approximately 2 metres long and over a metre wide. It has been cast in bronze with an off white patination, with polished bronze highlights. The artwork, titled ‘Instinct’ was commissioned by Mayo County Council’s Arts office as part of the ongoing public art commissioning programme, funded via the government’s per cent for art scheme and also Ballina Town Council. The Percent for art scheme brings in additional funding for an area and is linked to local building initiatives, in this case the improvements to the water supply scheme. 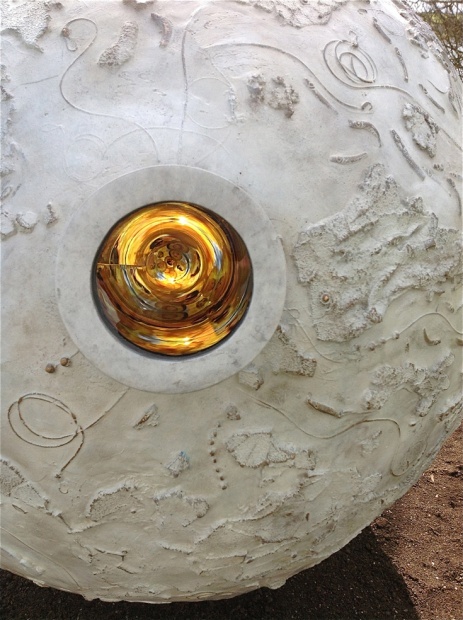 The sculpture’s surface is richly textured, giving an overall impression of a geographical map of the globe. It shows the migratory routes of the Atlantic salmon that return every year to the River Moy to spawn. The equator line is suggested by the small seam of a typical float. The ocean currents, migratory paths, weather patterns and general topography are illustrated with hundreds of tiny fishing flies, hooks, nylon lines, small weights and floats which are highlighted on the surface through the polished bronze. Local fishing experts and tackle shops have assisted Rachel, giving her advice on the various fishing techniques, tackle and fly tying that is specifically used for salmon fishing. As well as the highly tactile surface, there is a surprise when you look inside a special viewing place in the sculpture, where a Kaleidoscope like effect will appear. where what appears to be a bright petri dish of blue and green salmon embryos will appear. The artist commented that “I am interested in the relationship between angler and the salmon. It is a sport that requires huge dedication, passion and commitment to adhere to conservation measures to protect the life cycle of the salmon. The egg itself is a very powerful, positive symbol associated with new life and potential. It is reflective of the abundance of wildlife and regeneration along the river Moy”.